Yesterday I took the day off. I bought some sandwiches, snacks and drinks, packed them into my big messenger bag, and got on bus 22 towards the Marina. I spent most of the day in the Presidio, or walking. I did an awful lot of walking, now that I think of it. So here are some photos and thoughts from my day off. I make no promises of anything interesting turning up in this post. Crissy Field was an airstrip nearly a hundred years ago, back when runways were flat grassy fields rather than concrete, and planes were called “kites” by pilots because they were mostly canvas over wood frames. I’d offer more history, but for some reason the internet has decided not to load any of the National Park Service pages. So we’ll move on. Right now the field is populated by giant metal sculptures. And I mean giant, these suckers are huge. The “head” part weighs six tons & swivels freely in the wind. I’ve only ever seen it facing west, though. Of the eight or nine sculptures, only two really talk to me as art, and they both have parts that rotate freely in the wind, like a weathervane. I’m not sure what that says about me. But this one has an interesting history and is worth discussing a bit. This sculpture sparked public debate and controversy in 1974 when it was displayed outside the county courthouse in Oakland, and was ultimately removed. I’m tempted to say something about more sensitive times in the past when artistic decisions could spark scandal and outrage, but, well, twerking. 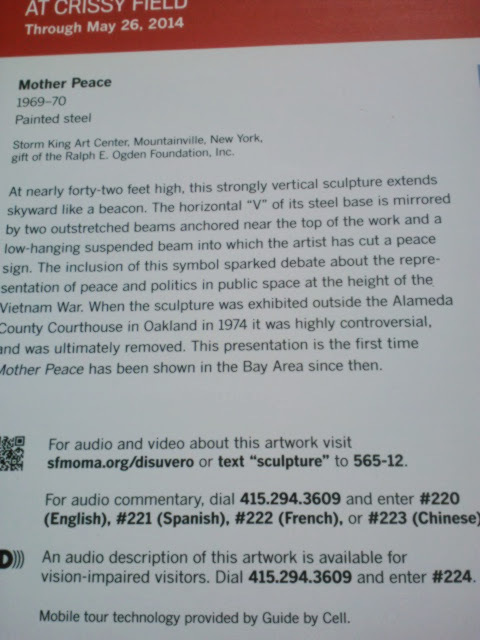 You can hear commentary on the piece by someone who actually knows something about art by calling 415-294-3609 and entering #220. I’m mostly including this pic because that phone commentary system is so interesting. You can probably navigate the menus in there and learn about all the pieces in the exhibition. 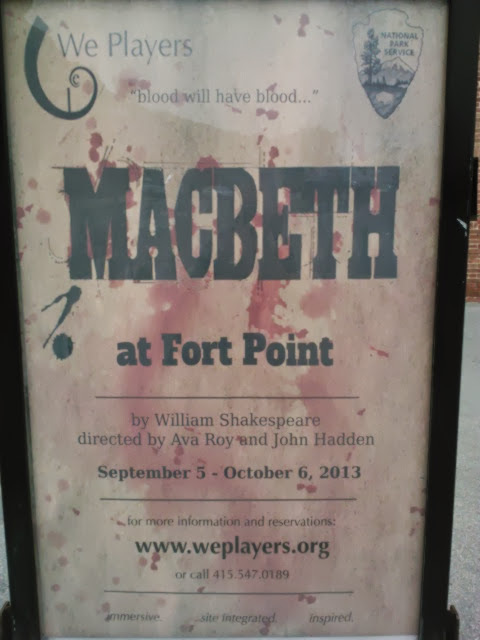 After pondering the sculptures a bit, I ate lunch and then moved on to Fort Point, which will be hosting Shakespeare soon. Someone come see this with me! 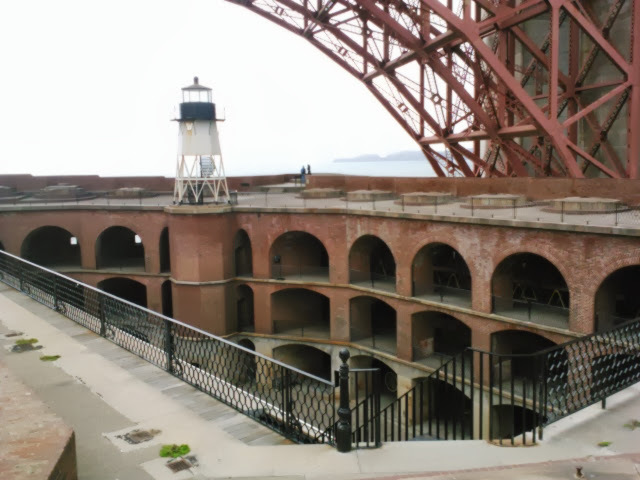 Fort Point is a Civil War era construction, and once defended the Golden Gate by simple virtue of having big enough guns to hit the far shore. 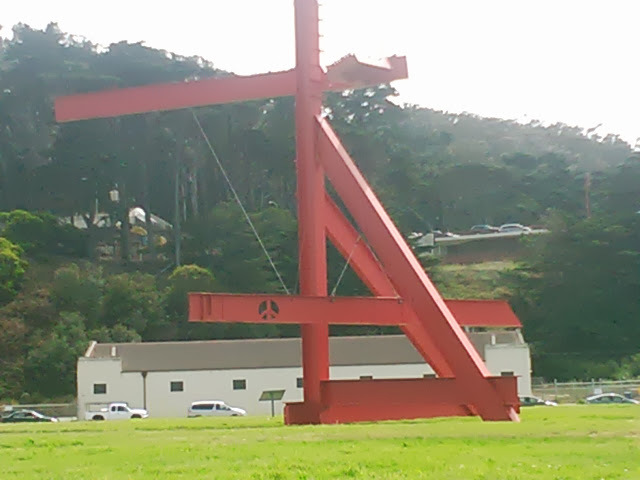 Now a museum, it sits underneath the south span of the Golden Gate Bridge. In the winter there are candlelight tours of the fort, which I am going to do even if I have to go alone. See the lighthouse across the yard there? Underneath is a stone spiral stair down to ground level. There are three of these stairs in the fort, with steep stone steps and warning signs that the stairs are slippery when wet. They’re a little hairy to use when dry, too. I keep imagining the soldiers grousing about those stairs, they’re already in a job where being shot at is an occupational hazard, and now they have to worry about treacherous stairs, too. Can’t catch a break. One of my favorite exhibits inside the fort is a box of fog. Boxed Fog. Cheaper if you buy in bulk, of course. 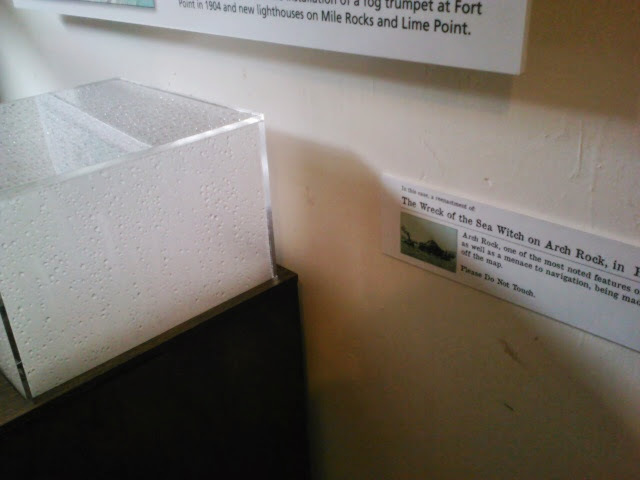 The sign to the right tells us that inside the box is a re-enactment of the wreck of the Sea Witch, and I imagine that this is pretty much how the scene looked when it happened. Most likely there is an actual model in the box, and it was only the weather that caused this, but I think it’s more fun to imagine that this is what it’s supposed to be, a representation of thick fog which caused the wreck. 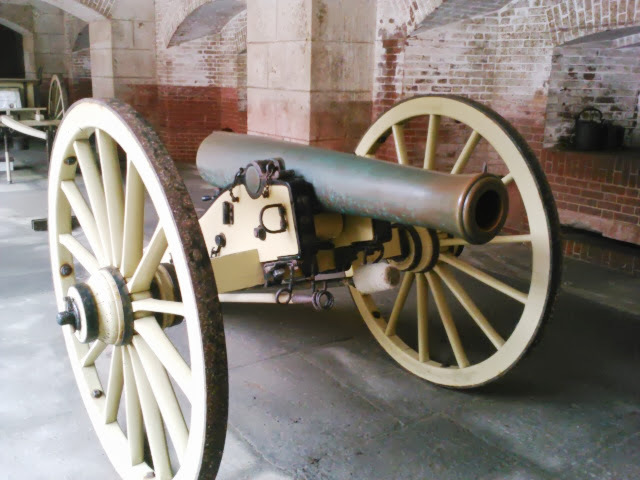 While at the fort I participated in a demonstration loading a field artillery piece, a twelve pound Napoleon gun. The ranger presiding clearly tried to give preference to children, but since only two kids were interested in working with the old gun, I got to play too. I don’t recall what my actual job was called, or even if it had a name, but my duty was to cover the touchhole while the gun was loaded, and then pierce the cartridge to prepare it for firing. My commanding gunner, a boy about 8 years old, did a fine job maintaining discipline and giving clear orders. Special mention should go to the ramrod operator, a little girl who could barely lift the big pole but nevertheless enthusiastically swabbed the barrel and ran the shot home. A fine crew, all of them. I’m adding this to my résumé. After I left the fort, I walked back toward Crissy Field and sat near the warming hut. I had a snack and threw a tennis ball for a dog for a while before making my slow way back to the bus routes I knew. And that, more or less, was my day off. I haven’t told everything here, of course, but that’s the most interesting stuff that I can remember. Have a lovely weekend everyone, and I’ll be back the next time I have the itch to write. 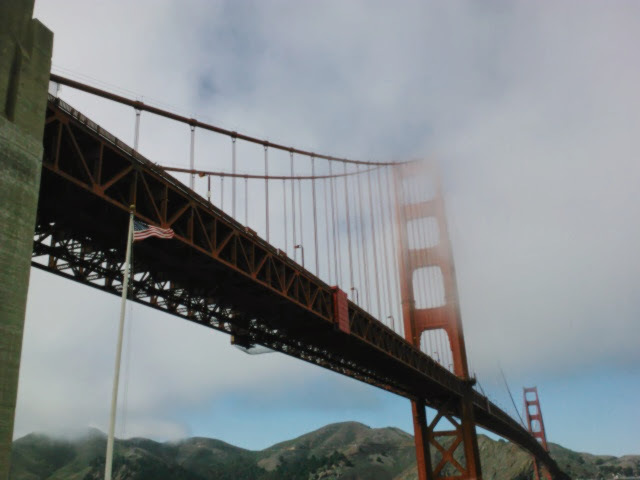 The bridge, the flag, and @KarlTheFog. 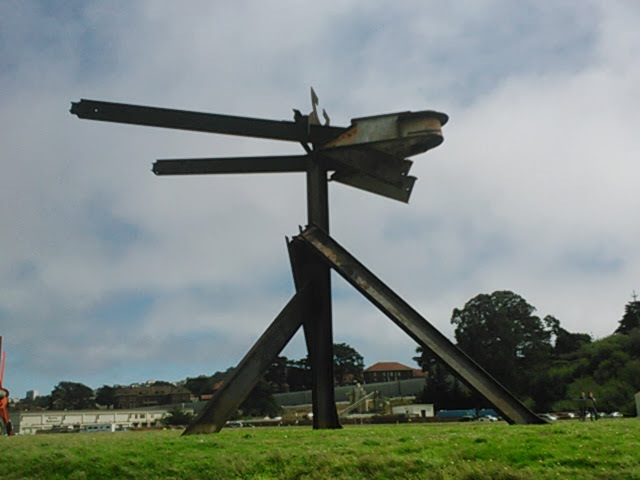 Posted on September 1, 2013, in Daily Post and tagged Crissy Field, Fort Point, giant metal, history, I love this city, metal sculptures, random, San Francisco, The Presidio. Bookmark the permalink. 2 Comments. I think a box of fog would be tremendously useful to have. I don’t know what you would actually do with it… but then there’s no shortage of fog here, Karl sees to that.